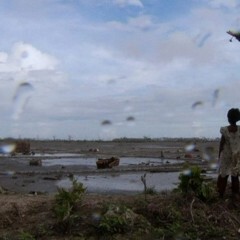 In May 2008 a cyclone called Nargis raged for hours in Myanmars Ayeyarwaddy Delta, killing 140,000 people. Two Burmese filmmakers couldn't remain silent and felt compelled to go to the delta and record the devastation. Seven days after the storm, they made their way to scenes of utter devastation. They met villagers who had lost everything, and recorded scenes that touched them to the core, such as rain-drenched survivors searching for wood and nails in the mud in order to build a roof over their heads. Life was going on, somehow, in the most fragile of settings and yet it felt as if time had stood still. Moving through a world that appeared more surreal than real, life and death seemed to coexist and survivors talked about the dead as if they were still with them. The cyclone had inscribed itself in everyone´s memory. Who could ever forget Nargis? Does the water have a memory? The filmmakers have carefully woven these emotions into an intimate and poetic film that powerfully conveys what it means when a natural disaster changes forever the lives of so many.